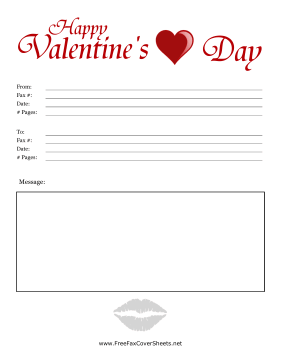 This romantic fax cover sheet says Happy Valentine's Day across the top with a red heart and has a lipstick kiss at the bottom. Cover sheets in PDF format are ready to print and use. They can be opened and printed with Adobe Acrobat Reader. Cover sheets in DOC format can be opened and printed with Microsoft Word and many other word processors. You can customize these files by adding your business name, address, and logo if desired. Ready to give up your old fax machine in exchange for convenient Internet faxes? Read this FAQ on Internet fax services. Get easy answers to your fax questions. If you don't see a cover sheet design or category that you want, please take a moment to let us know what you are looking for.